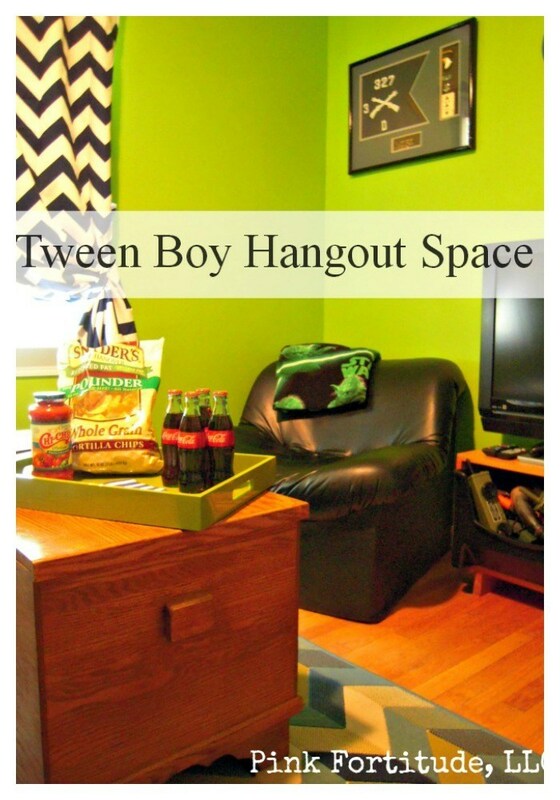 We wanted to give Stepson a cool hangout space for him and his friends as he grows into his teen years, so we recently swapped Hubby’s office and Stepson’s playroom for a major room transition to make it a reality. We wanted to create a “cool space” for the boys to have to their own and feel comfortable in – the boys are going to be somewhere and you can’t argue with having them under your roof and knowing where they are! 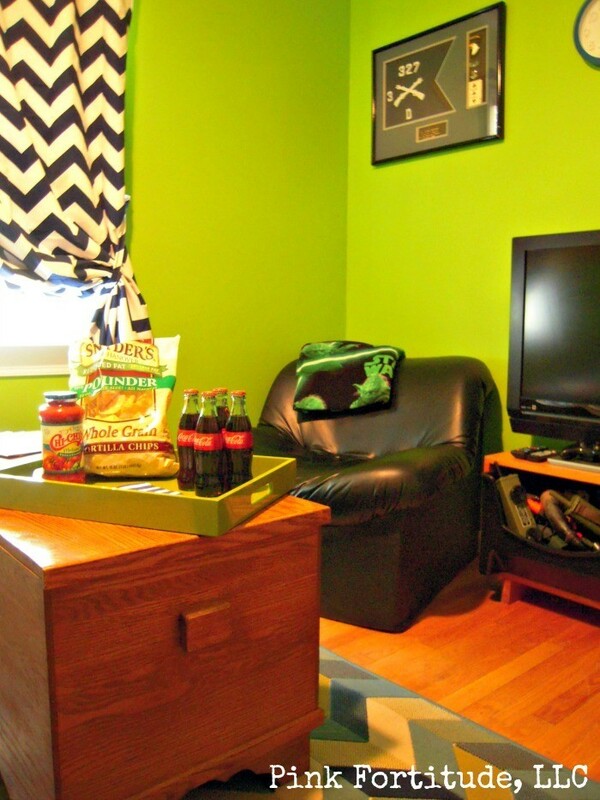 When I asked Stepson what he wanted the room to look like, his response was, “lime green.” Alrighty then. Being hesitant as anyone would be, I asked him the same question in different ways on different days and got the same answer. I put paint swatches on the wall and got the same answer. 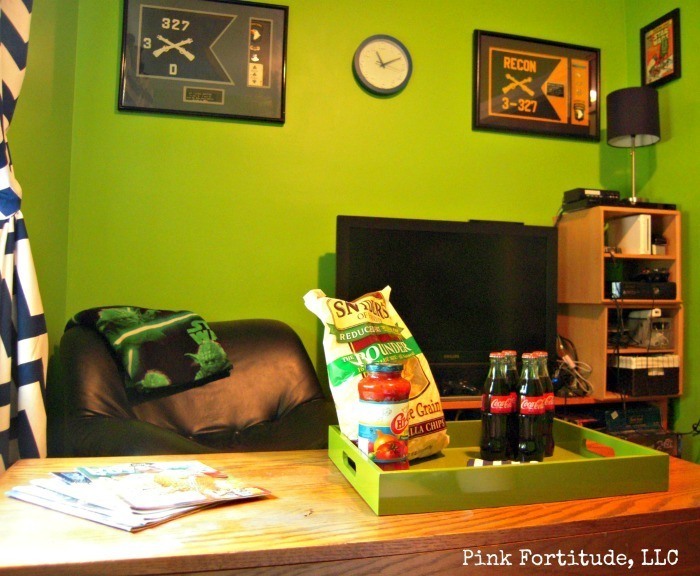 So a lime green Xbox room it is. 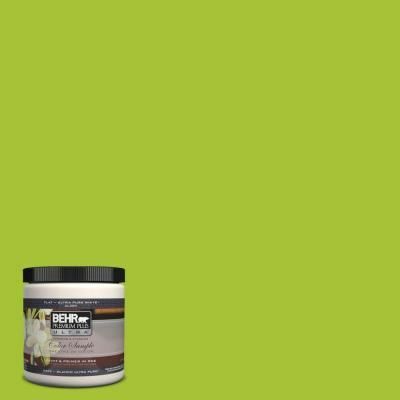 We used Green Crush by Behr. Now the fun begins. 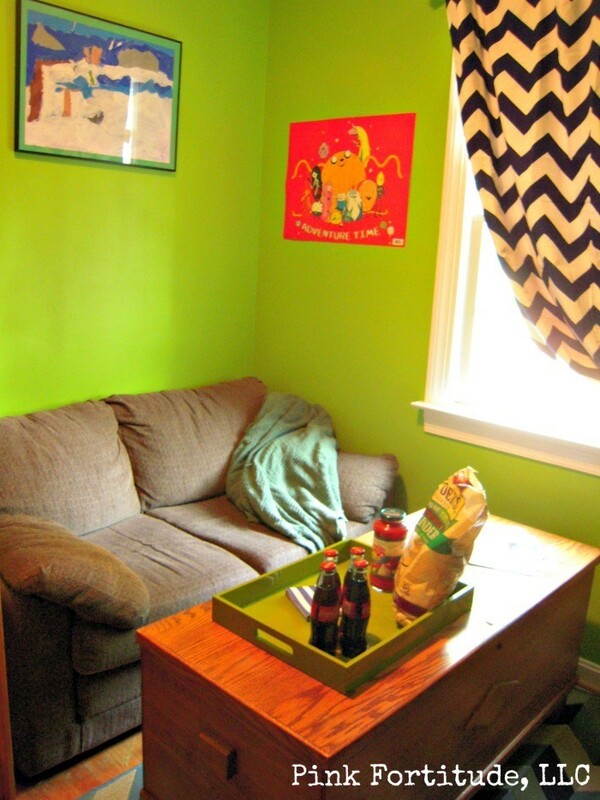 How do we design a lime green Xbox room so it’s tween/teen-friendly and super cool, but still meets the decor and budget requirements of the parents? This is the design board I pulled together on Pinterest. Navy blue, brown, and black were used as the complimentary colors. Before we begin the tour, let’s set some expectations. 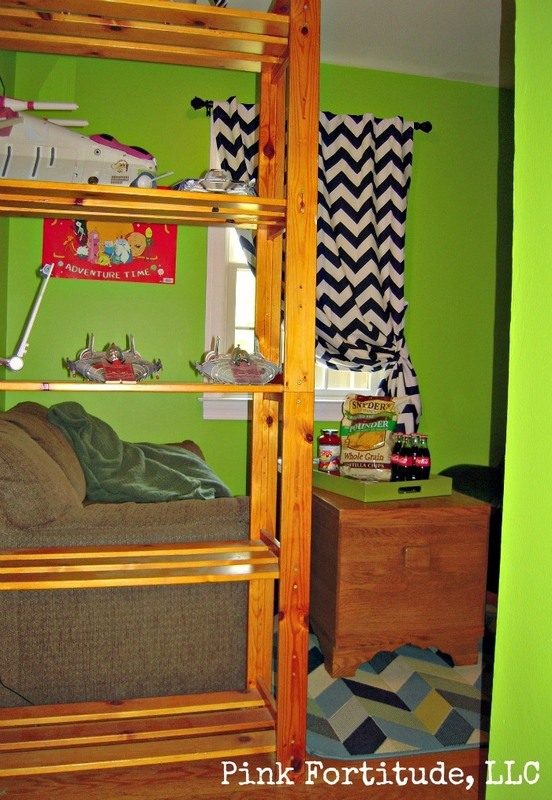 Have you ever seen a REAL kids room before? It’s pretty much 25% what mom manages to organized and 75% random stuff all over the place, on its best day. 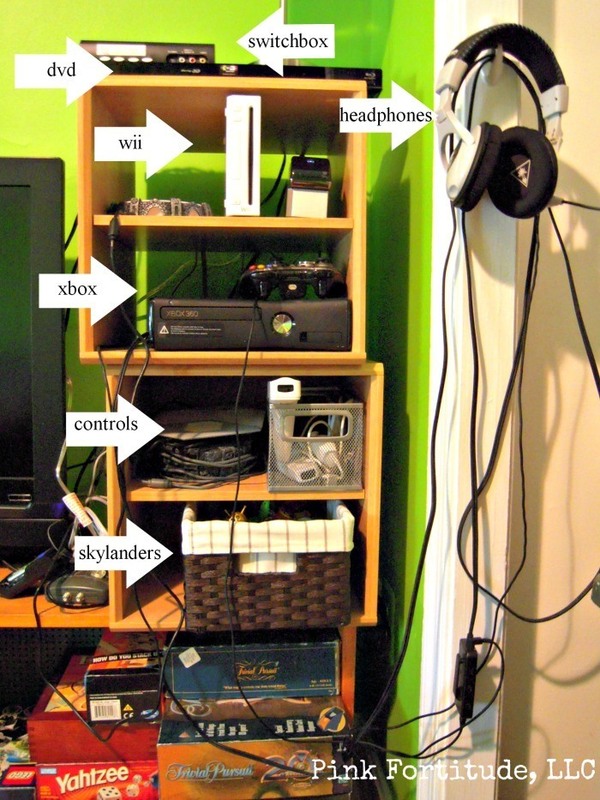 And a tween/teen room with all of the cords for XBox and Wii and all other electronics – can there be any more cords living in one space? Let’s face it, as much as we love to drool over the catalogs and magazines and perfect Pinterest pictures, normal kids rooms do not look like page 27 of the Pottery Barn Teen catalog. Think of your most organized friend. What does her kid’s room look like? I rest my case. That being said… I am including a few glamour shots, but for the most part, nothing was “purposely staged” except for the snacks. I cleaned the room and this is what you get. Here is the first look into the room. The major constraint we had to work around was that this room is the primary heating and cooling source of our inefficient split level house. We needed to find a happy medium to provide privacy, yet not have a closed door and space. We removed the door, and hung curtains to give privacy while allowing air to flow to the remainder of the house. Everyone seems to be happy with the configuration. If you look close, you will see I used one of the blackout curtain panels for the doorway, and the other for the small window. 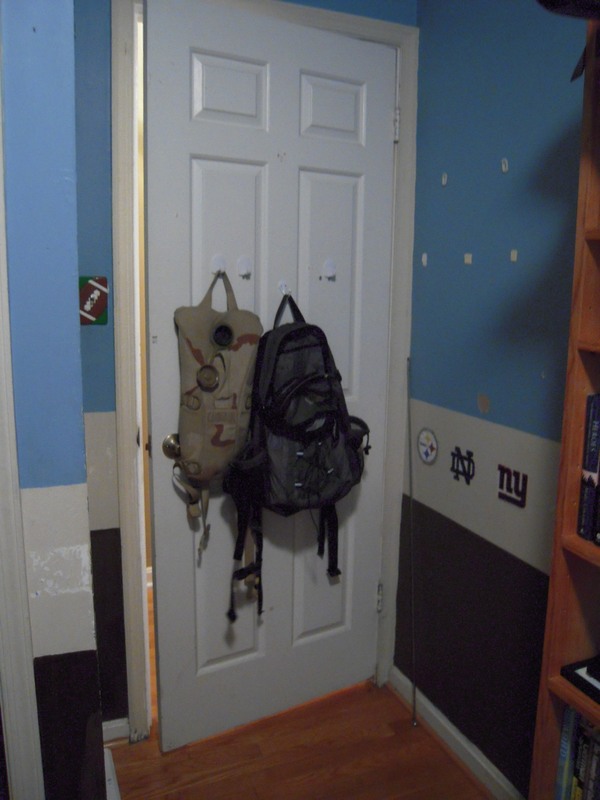 This is a before picture of the entrance of the room. 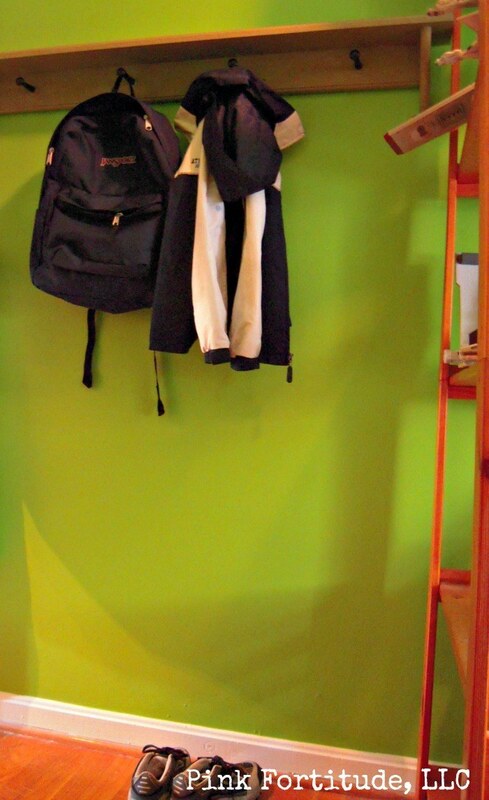 Now, this space on the wall is used for Stepson’s own coat rack for him and his friends to hang their coats, backpacks, and leave their shoes. I know, I’m living in a dream world. The reality is that everything will end up on the floor in a big pile. 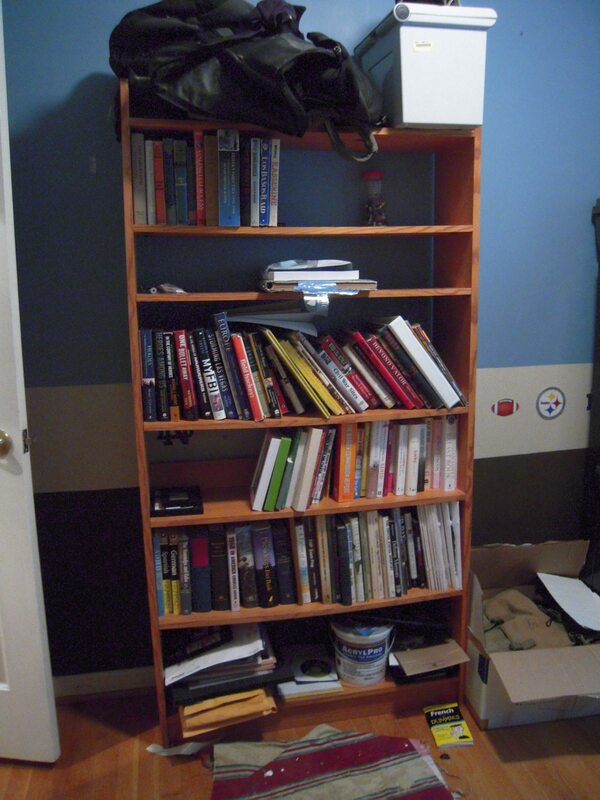 This shelf was taken from Stepson’s bedroom. It still needs to be painted to match the new room. Item #572 on my honey do list. The bookcase was placed perpendicular to the wall instead of against the wall to provide extra space and give the room a little more character. Not that the lime green walls don’t provide enough character. I found the bookcase at a yard sale. I asked, “how much?” “How much do you want to pay?” “It’s for my Stepson’s room and I don’t want to spend any more than $10.00 for it.” “How about $7.00?” Uh… ok? Continuing along the same wall, this is a before picture of where Hubby’s office used to be. We knew it would be a temporary space, so we didn’t put much effort into it. Obviously. Now this wall is home to a couch that I found at the Habitat Store. BTW – I absolutely LOVE the Habitat Store. It was priced at $45.00. I gave the sales guy the big doe eyes and smile and took it home for $25.00. I have no shame when I shop. None. The picture behind the wall was one that Stepson drew. 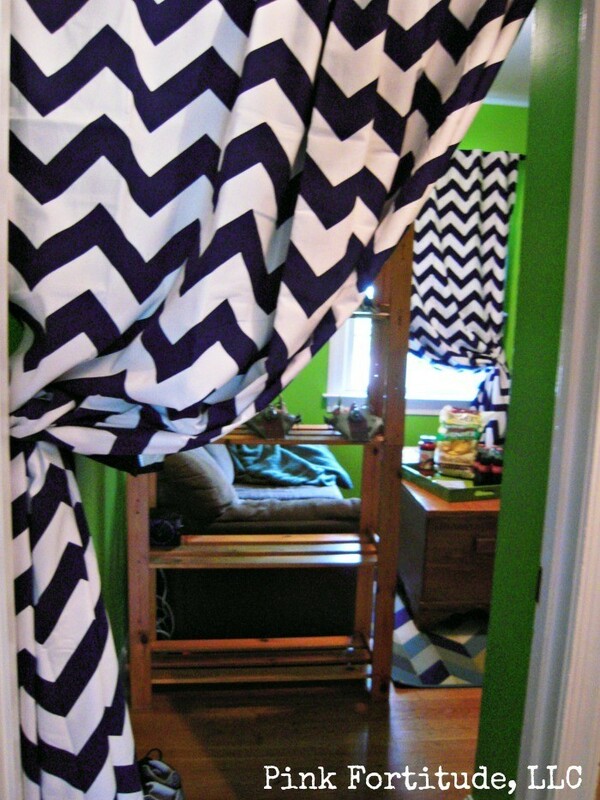 The navy blue chevron curtains are from Pottery Barn Teen. Since we were able to design the room for next to nothing, the curtains were my “splurge” and they actually weren’t even that much. The chest was mine, and contains some of Stepson’s old toys that he isn’t quite ready to part with. We went with an outdoor rug from Grandin Road, to provide a little more durability and spillability for a boys room. 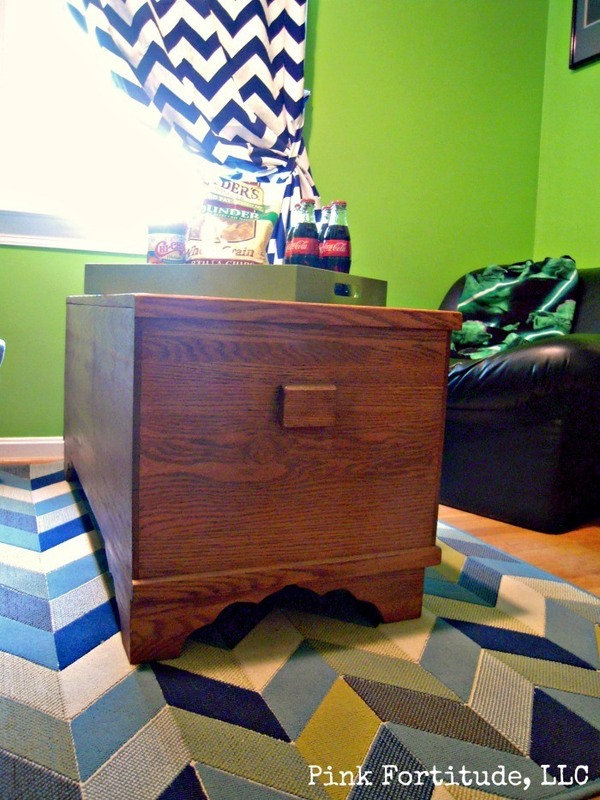 And yes, I did mix my chevrons. Bring it. Continuing on to the third wall, here is the before picture. This is where Hubby had his computer and office stuff. This is what the same wall looks like now. The view is from sitting on the couch. It’s very comfy BTW! The black chair was a hand-me-down from my friend Karen, who had it in her teen room back in the day. The TV was a hand-me-down from our friend Sunday Steve. The prints are from Hubby’s Army career. The lamp, clock, and storage cubes are from Target. Here’s another view of the same wall. Now this is where it got fun. 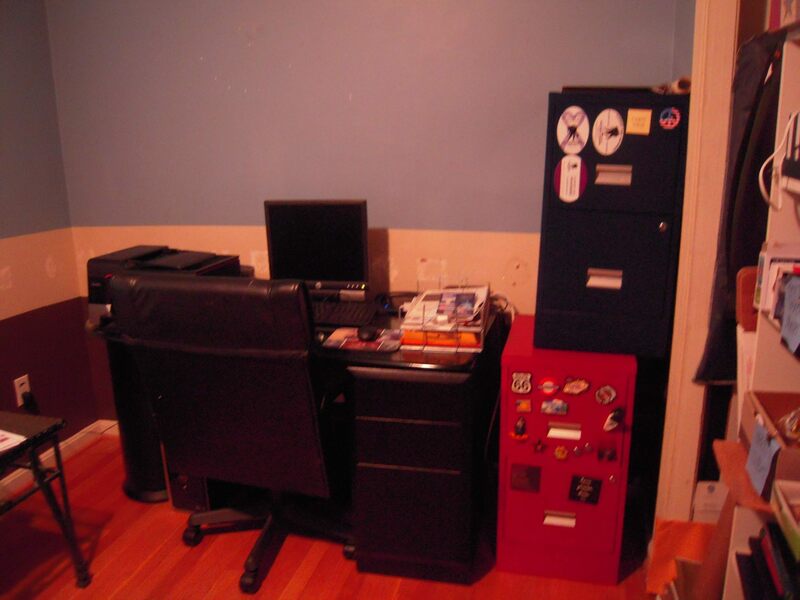 Organizing this room to keep a lot of Stepson’s toys that he is not ready to part with, along with the games and teen stuff he is currently using, in a room that is one quarter smaller than he was in before was a challenge. We use a switchbox to switch between XBox, Wii, and the DVD player. We don’t have cable run to this room. Yet. The majority of the time, the headset is on the chest for easy access, but when the room needs to be straightened up, a command hook is perfect to wrangle the headset. And the closet. Oh the closet. I won’t say another word because the picture speaks for itself. Star Wars toys, a million and one nerf guns, video games, DVDs, and all kinds of random boy stuff are all organized. As much as it can be anyway. 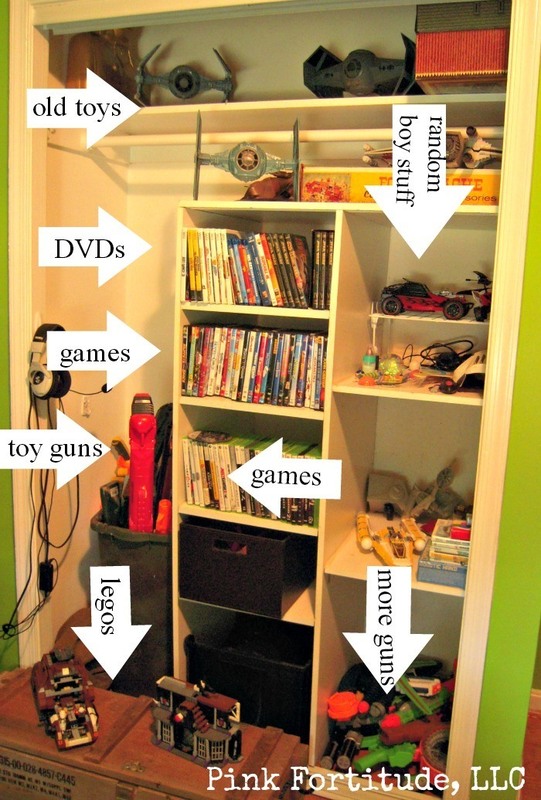 Do you see the pile of smaller toys guns on the right side floor of the closet? I was going to buy a container for these and realized that they are going to end up in a big pile on the floor of the closet anyway. So there. You will notice that we removed the closet doors as well. It helps to open up a very small room. Here is one final look of the room. 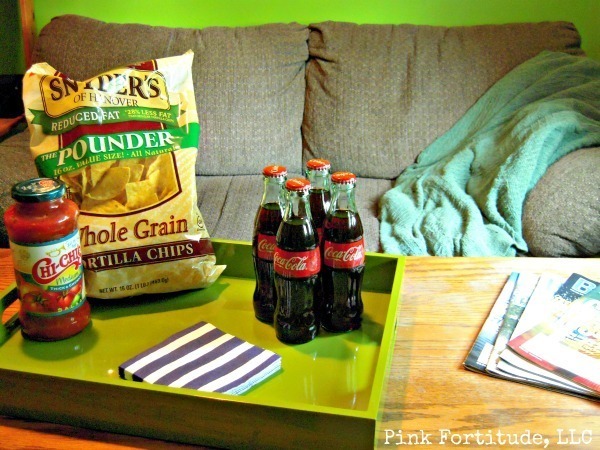 Kick your feet up and grab some chips and join the fun. Stepson loves his new space. Loves it. We hope the boys have many years of fun in here. Stepson’s Army camo bedroom is in the adjoining room. If you haven’t seen it yet, it’s worth a quick tour! Well…. what do you think of the new space? I would love to hear your thoughts and comments! Especially if you have any better ideas for organizing all of the electronics. I’m all ears! Love, hugs, and letting boys be boys. Holly – it looks great – can’t wait to see the new room !!! Wishing to be eleven again. I really love the room! Perfect place for your stepson and his friends. I am sure his Dad will be in there too! You did a great job making a small room look bigger and hold a lot of “boy” stuff! By the way, my daughter had a room this color when she was about 12. I can remember it cast a glow down the hallway! 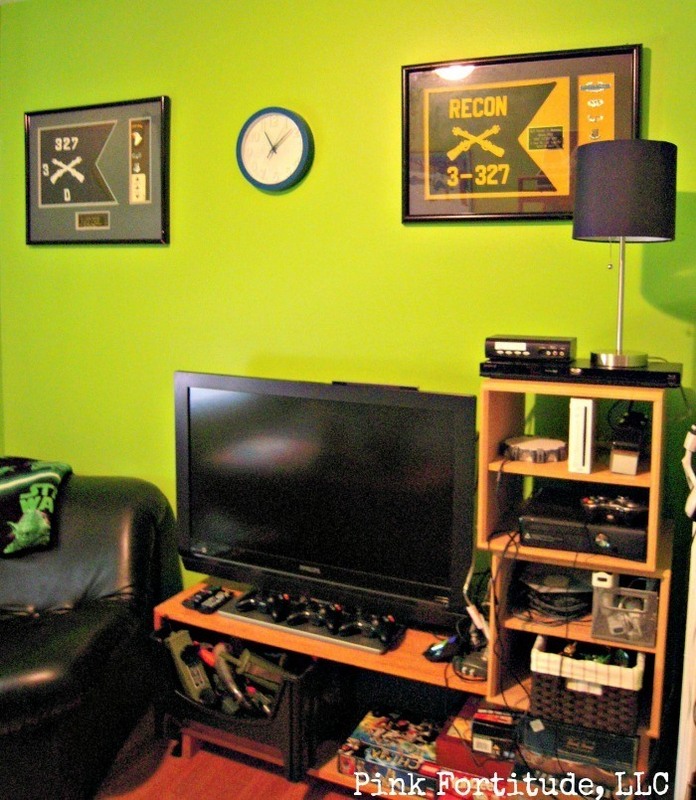 What a perfect room for a tween/teen boy. I know he must be thrilled with it. I love the rug and the organization. You rocked this one, Holly. One of my husband’s friends had a ‘teen hangout’ when he was growing up. Now, he plans on putting one together when our kids are older. Yours is VERY awesome. Thanks for sharing. What a great room, it’s so comfy, and it’s workable. Hope you have a great day! I think it’s great you invested in creating a hang out room for your son! My parents bought some special pieces from Pottery Barn to make our second-floor loft into a hang out room growing up, and I loved having our own space! Absolutely LOVE this! More importantly, my 13 year old will! I have pinned it, and just love your end results. Great job! What a great room! My tween Daughter is big into lime green too. I don’t know what it is about lime green that appeals so much. I love how the room looks more grown up without looking too grown up, I hope to capture that in my daughter’s room too. Thanks for the inspiration and for sharing it with us on Snickerdoodle Sunday! What a fun space! ….and I’m so in love with that rug! Thanks for linking it up at Monday Funday! Looks awesome, Holly! Thank you bunches for linking up and partying with us again this week! That is a amazing spot for a teen to hang out. I wish I had something like that when I was growing up. Thank you for sharing at Friday Favorites!